At Hornblower Niagara Cruises, we treat every guest like a VIP and this past Tuesday we certainty had the experience to welcome a group of world famous VIPS on board the Hornblower Thunder. 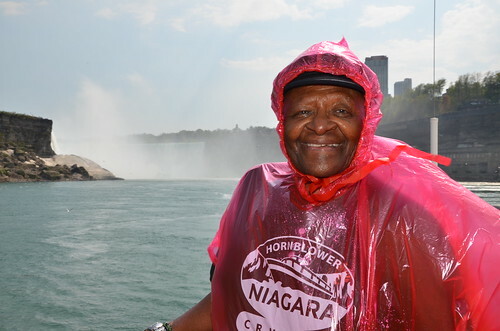 Nobel Peace Prize Laureate Archbishop Desmond Tutu was among a contingent of 60 from the St. John Chief Executive Group who visited Hornblower Niagara Cruises on May 27, 2014, as part of a day excursion to Niagara Falls. The excursion to Niagara Falls included a visit to Hornblower Niagara Cruises as a part of a formal programme for the St. John Chief Executive Group meeting convening in Toronto, which began on May 25, 2014. As the group disembarked the motor coach buses they were welcomed by a number of smiling Niagara Cruises employees who were anxious to meet Archbishop Desmond Tutu who lifelong achievements include being honoured with the Peace Prize in 1984 for his opposition to South Africa’s brutal apartheid regime. Tutu was saluted by the Nobel Committee for his clear views and his fearless stance, characteristics which had made him a unifying symbol for all African freedom fighters. Born in 1931 in Klerksdorp, Transvaal, Tutu and his family later moved when he was 12 to Johannesburg, South Africa. In 1960, Tutu was ordained as a priest and followed theology and the priesthood to London, England before returning and becoming Bishop Lesotho from 1976-1978 followed by being the first black General Secretary of South African Council of Churches. It was said that it was here that proved Tutu to be a national and international figure. Tutu became a part of spoke out against injustices of the apartheid system and is considered a monumental figure of equality and peace throughout the world. With the remarkable journey he continues to create, Hornblower Niagara Cruises was beyond thrilled to welcome Archbishop Desmond Tutu to Niagara Falls, Canada to experience the mighty and world renowned Falls. His footsteps surely leave an impact anywhere he travels and for the lucky folks on board the Hornblower Thunder they too have a greater lasting memory on board the catamaran. The visit ended with many photos and laughs under our fully covered Visitor Pavilion. Thank you to St. Johns Ambulance for including Niagara Falls, Canada and Hornblower Niagara Cruises as a highlight in your 11 day Canadian journey.